A LITTLE OVER TWO YEARS AGO, what my wife, Barbara, and I had dreamed about finally happened! We could “retire,” whatever that meant. There it was, staring us in the face, no longer a far-off event. Retirement was a time to reflect on what mattered most. What had we truly accomplished? Had we made a difference? It was also a time to ask, “Now what?” Now that we have more free time and more resources, how do we spend the rest of our lives? Can we leverage the lessons we’ve learned to make a difference? The lessons of the last three decades — both in my work as a corporate executive and in our family life — came down to people. The successes were about people. The rewards were about people. The memories and lasting impacts were all people-related. We also knew that the richness of diversity had significantly enhanced those successes, rewards and memories. When Barb and I moved to London in 1995 so I could head MediaOne International, it was my job to oversee 13 ventures in 16 countries. At the time, things were not working well. The company was losing a lot of money each year. So I set about finding a team of highly talented people with different ways of approaching a problem. Eventually our boardroom looked very different than most American boardrooms. We had managers from five countries, both men and women, and a mix of ethnicities. Staff meetings were also very different. None of us thought the same way, so we argued a lot — but the result was a rich group process with mutual respect and a great deal of success as the businesses turned around dramatically. That is just one example of the power in diversity we have observed. It has been the same in Barb’s and my personal experiences. There is a richness in our lives because we have sought out relationships with people different from us. When MediaOne was sold, we retired and decided to make our home in Seattle. One thing that struck us when we moved to Seattle was that the city was going through significant race-relations problems. We asked ourselves: How can we be part of the solution to this problem? What unique strategies can we use? How can we line up those strategies with our Christian orientation? Because we feel strongly that lack of money makes it difficult for minority students to get a quality education in America, it made sense to invest in those students. We gave first to our alma mater, Portland State University, establishing minority scholarships there, but then we turned to Seattle Pacific University as a way of supporting students in our home community of Seattle. We found Seattle Pacific a natural place to invest because of its vision for engaging the culture, because it is a quality Christian university — and because it has a diversity problem. For SPU to be relevant in the Seattle community, it can’t be 90 percent white. That’s an incredibly difficult problem to solve, but the University seems to be committed to working on the issue. We felt our resources could help. 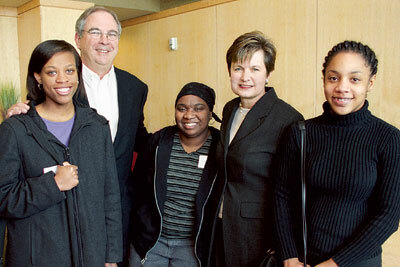 Today, 13 minority students at SPU are the recipients of Ames Scholarships. I don’t think the resources Barb and I have been given are really ours; we’re just stewards of them. There’s a series of resources that God gives us as people, including talents, experiences, time and money — with money probably being the least important. I don’t think God put me on earth just to be CEO of a telecommunications company; I think he wants me to put my gifts to work for the benefit of people. We’ve decided to concentrate the next phase of our lives on investing in our community. We look for places, like Seattle Pacific, where people want to address similar issues, where we can nurture an idea, and where we can involve others to increase the impact of our resources. Barb and I are just starting this journey. The easy part is giving the Lord’s money. The more difficult task is leveraging it with the ideas, risk-taking and dreams of many people. That will be exciting! The former president and CEO of US West Communications, Gary Ames took over as CEO of MediaOne International in 1995. In retirement, he and his wife, Barbara, started the Ames Family Foundation, which has funded The Ames Initiative on Diversity at SPU. The Initiative includes, among other things, scholarships, faculty mentoring and vocational guidance for minority students. Gary Ames is also one of two new members on the SPU Board of Trustees.